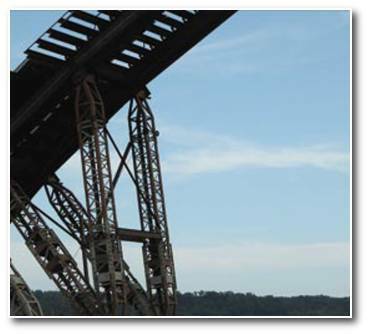 The project required the installation and monitoring of strain gauges for the strand end replacement project at the south anchorage sections of the 10th Street Bridge. Initially 63 strain gauges were installed on a total of 38 existing eye bars, which were arranged in pairs (19 pairs). The eye bars were anchored to the ground on one end, and each pair was pinned to a group of strands, which formed the main suspender cable, on the opposite end. Once all eye bar strain gauges were installed, the strand end replacement procedure began by cutting a section of cable that was pinned to a pair of eye bars. The strain gauge readings were recorded providing the project engineer with an accurate description of how the load from the cut strand was distributed over the remaining 18 pairs of eye bars. The contractor next installed the new end construction, which was designed to be adjustable via a 3-12″ diameter threaded rod. Two strain gauges were installed on the adjustable rod. The new assembly was then loaded to a specified stress level by Bolttech-Mannings’ hydraulic stud tensioning system. The stress level in the rod was based upon data supplied by the strain gauges. A complete set of readings was then taken to define the new load distribution of the eye bars. This procedure was repeated for the remaining 18 connections of the east suspender cable, which resulted in the monitoring of 101 strain gauge channels. Bolttech-Mannings completed work on the 19 connections of the west suspender cable in April of 1994. The project required the installation of strain gauges on opposing faces of 20 boiler support straps. This was done to identify changes in load during demolition, load transfer, and reconstruction of the economizer section of the boiler. Baseline readings for all strain gauges were established prior to boiler shutdown. Upon removal of lower economizer casing and internal piping. During load transfer spring activation. Upon the completed installation of all new economizer sections, piping, and associated casing and duct work. The project required the installation and monitoring of stain gauges on 22 boiler hanger rods that support the rear and partition walls of an economizer designed by the Foster Wheeler Corporation. The strain gauges were installed prior to the outage and were monitored weekly during the economizer replacement to track load conditions. Once replacement was completed Bolttech-Mannings installed hydraulic stud tensioners on each hanger rod and balanced the structural loads according to the specified load distribution. Individual support rod loads ranged from 93 to 180 (-5/+10) kips. The final partition wall load of 1950 kips was distributed over 14 hanger roads while a rear wall load of 700 kips was supported by 8 hanger rods. The project required the measurement of residual stress levels in 14 boiler hanger straps using strain gauge rosettes. The strain gauges were installed on opposite sides of the center of each hanger in areas removed from stress discontinuities such as welds or bolt patterns. Once the strain gauges were installed, the “zero” settings were established at each location. A milling machine was used to remove a 1″ core from the center strap, which contained the strain gauges. Each core was identified and the final strain readings were measured and recorded. 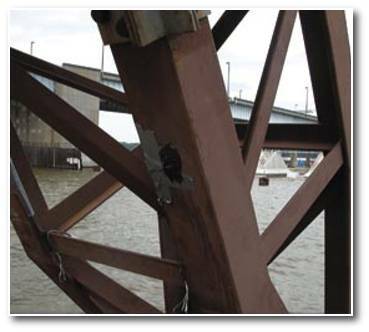 The project required the installation of strain gauges on the 72 U-Bolts that connect the floor beams to the truss hangers on the Smithfield Street Bridge. Bolttech-Mannings monitored the strain gauges while tightening the U-Bolt shanks to their prescribed level of stress using our Hydraulic Stud Tensioners. The tightening process was performed using two Hydraulic Stud Tensioners that were manifolded together and powered by a single pumping system. This technique made it possible to load both U-Bolt shanks simultaneously so the differential stress requirements were satisfied and all reaction torques were eliminated. It was necessary that the U-Bolt assemblies were provided with a minimum of 2-1/4″ of thread extension beyond the top of each nut. This made it possible for our tensioners to grip the U-Bolt shanks properly and make a safe pull. The following schematic provides a visual representation of our equipment setup.